Love the color selection I was able choose from when customizing these custom made bags for my business. Also, really liked the handles on the bag too. The customer service you guys gave me was off the charts. Always an immediate response every time I needed help or had any question. I highly recommend this company. Top notch service. Love these bags for my business. Promotional jute shopping bags that were a great fit for my business. Amazing bulk sale price. The image display of this bag is outstanding. I'm so pleased I shopped with CEP and plan on being a reliable customer season round. Using Custom Earth Promos was a great decision on my part. Not only are the bags very durable and eco-friendly but they are also very unique. These bags were a huge hit at our venue I was very happy with the color and image display! Very well made and durable these bags could hold a lot. The service I received from them was awesome, it will keep me coming back to them. Great bag, I use it as a free gift to all women who join our organization. The men get a reusable water bottle, both from custom earth promos. Good looking bag, the edge design sets off and accentuates our print. I would reorder this bag. I selected this model JB18 in the Lime Green color for a big party we hosted. It was a nice bag and all parties who paid admission loved the bag. I hope they come back in a couple months when we host the party again. The color of our print came out alot better then I thought, I was worried because I did not know how the ink would take to the Jute, but it took well and the bag looks amazing. All the exhibitors loved this bag, it was a great idea from our social media strategist on staff! This bag stands up over time, it was a gift that we gave to all employees who attended our 50th anniversary party. I still see a lot of women using it all the time. This year I am going to place an order with Custom Earth Promos for a different style bag. I sell this bag for a affordable price at my womens retail store along side a couple of other handbags. This bag is one of the top sellers, the zipper, the Jute, and the handles are all nice and this functions well as a hand bag for alot of my customers, I will keep on reordering as long as there buying them! I am very happy with our bag, the print looks good and now all of the female employees at our company have a nice bag that they can tote around with our company on it promoting us where ever they go. Popular amongst female customers at my grocery store. It promotes our store well, that is why I keep placing orders for this bag. In love with this Jute Tote! For a jute material bag, that is sold at wholesale quantities you can not beat this price and quality. Red and brown colors worked for us best with our company brand colors. I will order other bags from them in these colors. The JB18 is the nicest gift Jute bag they offer I purchased the JB3 and the JB12 for different events before and they are nice don't get me wrong but this bag is the nicest I recommend this bag. 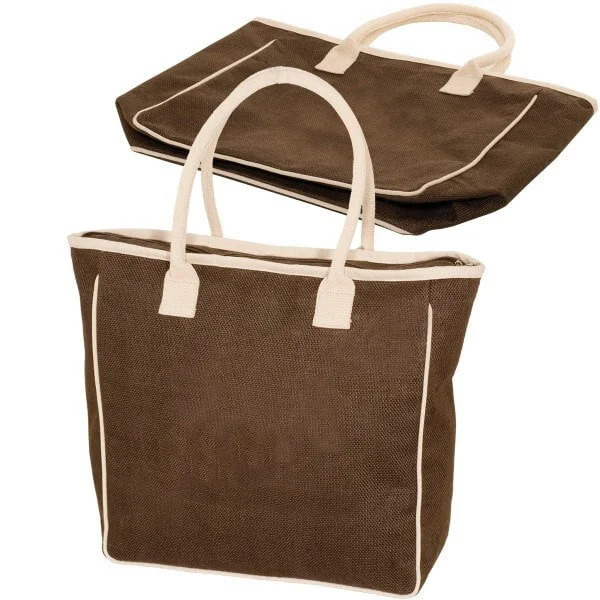 Our Promotional Jute Shopping Bag is a great giveaway option for discerning, fashion-conscious clients! Arriving in a variety of colors with distinctively contrasting trim and piping, this bag will certainly draw attention to your brand, the design of which will be prominently advertised on the front. After clients have this bag in their hands, they will be reticent to part with it, giving your brand long-lasting recognition through their use for years to come! 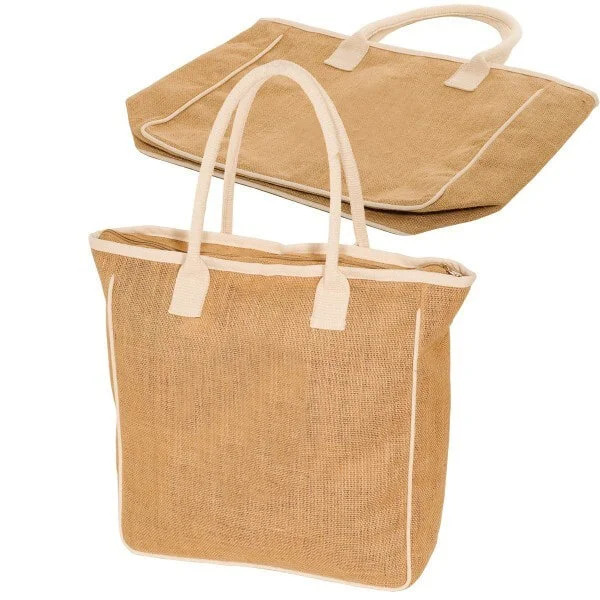 The fashionable and eco-friendly Promotional Jute Shopping Bag is produced with brand identification and recognition in mind. In addition to great color schemes and a zippered closure that securely protects your clients’ possessions, this shopping bag places the design of your choice front and center on the bag, ensuring that everyone who views it will be instinctively drawn. By purchasing this bag, you will also be strengthening your business and brand image by associating it with an environmentally responsible product. 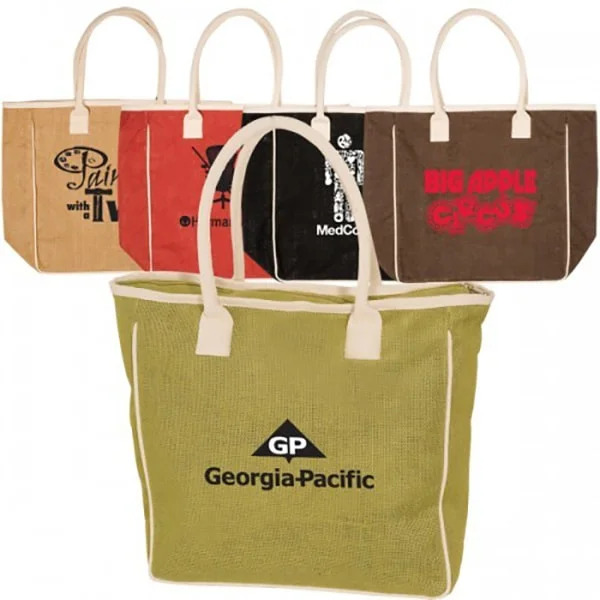 Our collection of Promotional Jute Shopping Bags is equipped to handle your clients’ most fervent and extensive shopping sprees! With 19” W x 14” H x 5” D dimensions and a 5” gusset, this shopping bag is spacious enough for a lengthy trip to the mall. Enhancing the accommodating size is the zippered main compartment which protects your clients’ valuables and recent purchases. 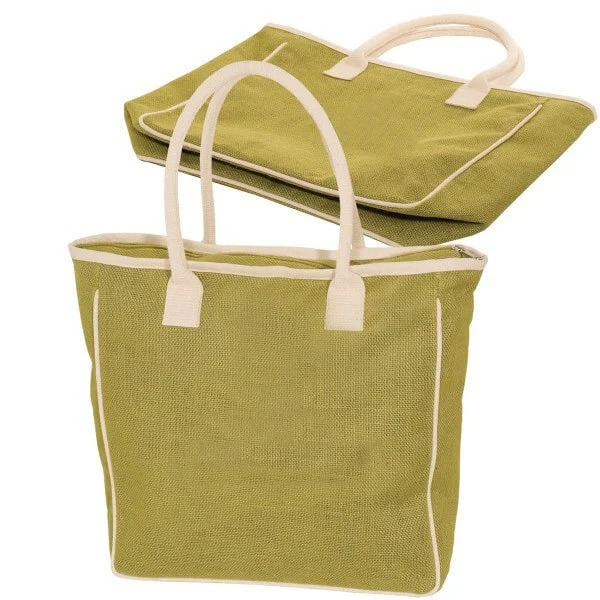 Made of a combination of jute and cotton, this shopping bag can stand up against the heaviest loads. Jute is renowned for its inherent durability, eco-friendliness (being biodegradable and recyclable), lightweight nature, and longevity. Even some of the heaviest loads will be able to be borne by this reliable bag! Supporting and enhancing the bag’s durability is a fully laminated interior. The interior also acts as a great means by which to clean the bag from unwanted substances and to protect against moisture that could otherwise infiltrate the bag. Finally, each bag comes with a pair of 19” padded cotton handles for ultimate comfort and adjustability. One certainly must not neglect the colorfully energetic aesthetics of this shopping bag! Your clients, both current and prospective, will be visually treated to five colors: Black, Brown, Lime Green, Natural, and Red. The colors are accentuated with a contrasting trim and piping which serve to illustrate more vividly the customizable design you choose for your brand. The imprint area for your design is substantially expansive at 10” W x 8” H and clients will be instinctively drawn to such brand appeal. The imprint method for this product is transfer with an optional imprint method of Image Bonding 4-Color Process. Our custom manufacturing facility is specialized in and committed to producing large, bulk quantities of items within the requested deadline. 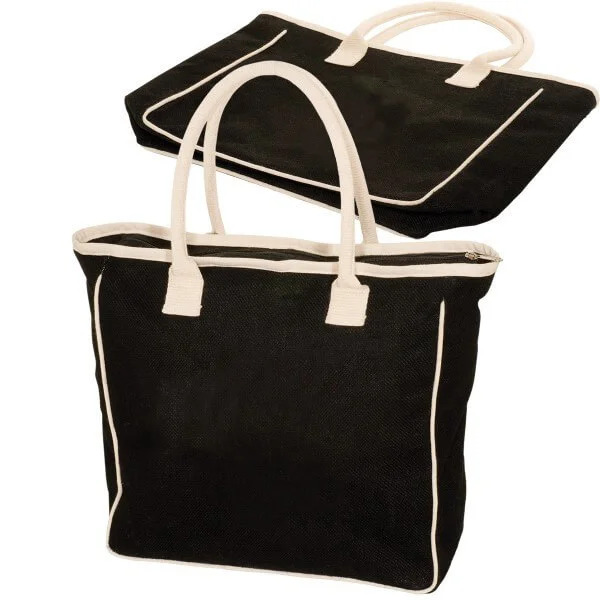 Each Promotional Jute Shopping Bag is fastidiously manufactured to your specific design requirements.